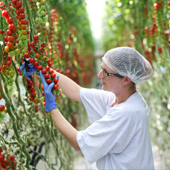 Producing your tomatoes of choice is an intensive and long term work. 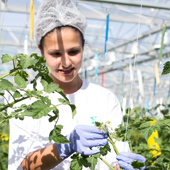 Between planting and packing, our employees execute numerous precise and meticulous tasks. 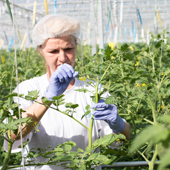 The major tasks are : pruning, picking and packaging. A tomato plant is a creeper. The work of the pruners consist in pruning the flowers to produce a regular vine. 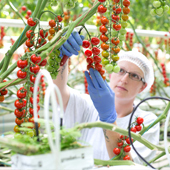 They also have to coil the plant around a rope to maintain it vertically. Each plant is pruned once a week. The pickers select and cut the ripe vines. 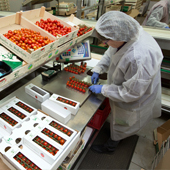 Once cut, the tomatoes are disposed in a box on a trolley. 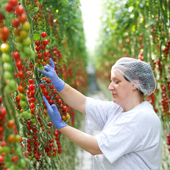 This is a meticulous task in order to prevent the tomatoes from being spoiled. Each parcel is picked every five days. Packing is the last step of a long process. 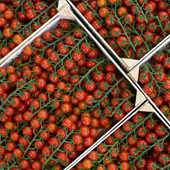 At this stage, the tomatoes are selected and packed accordingly. It is a critical task to value our tomatoes. Each box is then palletized for every clients. Based on the demand, some pallets can be composed of different references. 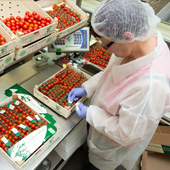 At the packing station, timing is crucial as the hauliers come everyday to load the tomatoes picked-up in the morning. Orders must be ready!